Trailing arbutus, Mayflower,or ground laurel,one of the best-loved American wildflowers, said by Whittier to have been the first blossom seen on these shores by the Pilgrims (introduction to “The Mayflowers”). The plant blooms in early spring; its creeping stems bear clusters of sweetly fragrant pink or white flowers that are sometimes hidden by the hairy evergreen leaves. The leaves were once used in making a diuretic tea and were also said to be astringent and tonic. Roots of the trailing arbutus live in a partnership arrangement (mycorrhiza) with a fungus (see symbiosis). The plant is difficult to cultivate, and its existence is endangered by the zeal of flower pickers. 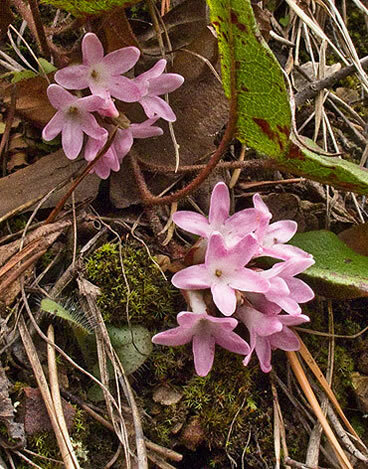 In its native habitat, trailing arbutus seems to prefer the acid soil of pinewoods of the eastern part of North America. It is the provincial flower of Nova Scotia and the state flower of Massachusetts, where a law protects the plant. ---Part Used---The leaves, used dried to make an infusion, and fresh to make a tincture. 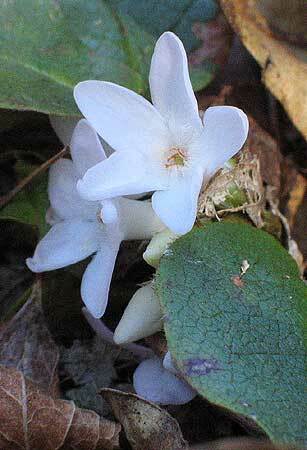 ---Habitat---The Trailing Arbutus (Epigaea repens, Linn.) 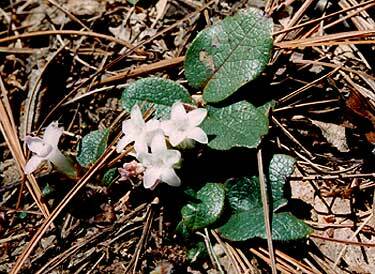 is a small evergreen creeping shrub, found in sandy soil in many parts of North America, in the shade of pines. Its natural home is under trees, and it will thrive in this country only in moist, sandy peat in shady places. It has long been known in cultivation here as an ornamental plant, having been introduced into Great Britain in 1736. Like the common Arbutus, or the Strawberry Tree and the Bearberry, it belongs to the order Ericacece, the family of the heaths.